Career girl Xie Xuanji, trained in speedy calculation, was transported back to ancient times after dying and lands in the body of a beautiful girl, a singer who was given to the Zhao Palace by a wealthy merchant. 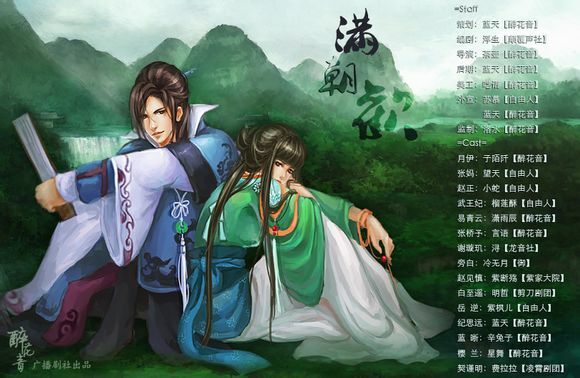 By a twist of fate, Xuanji saves the life of Prince Zhao’s mother, attracting the attention of Prince Zhao. Prince Zhao is surprised as he finds himself falling in love, attracted by her independence and ingenuity. Legend foretells her to be the reincarnation of a heavenly maiden, whoever that is able to obtain her would be able to unite the country. Thus, she attracts the attention of six countries. Despite her desiring for nothing more than a peaceful life, she is constantly thrown into turmoil, finding herself having to choose between the man she loves and a position as queen of the six palaces, how will she decide? It is unfortunate that the translator has stopped working on this series, because the few short chapters that I have read intrigued me. Basically it tells the story of an impish and lazy girl who caught the attention of some powerful people after she saved the Prince of Zhao's mother from an assassin. Of course, she only did it because her own life was at stake; she would very much prefer to eat, read and sleep in peace. MC is 16 of 17 and ML is 30 and has a 14 year old son from his death princess consort and has a backyard with a harem. I think it's too much backage and the son is close in age with the MC. So no Chu Fei Yan here. I like funny and uncomplicated romance.